The Human Rights Law and Policy Forum (HRLF) facilitates international internship opportunities for LLB and JD students of the CityU School of Law. Such internships not only allow students to earn credits but also gain valuable global perspectives as to how different organisations function. Students have been able to do internship with the UN Office of the High Commissioner for Human Rights (OHCHR) in Geneva as well as at human rights law firms and non-governmental organisations (NGO) in Seoul, South Korea. Some students have also assisted UN agencies (like UNDP) or the UN human rights experts in their projects as part of the United Nations Volunteers Programme. 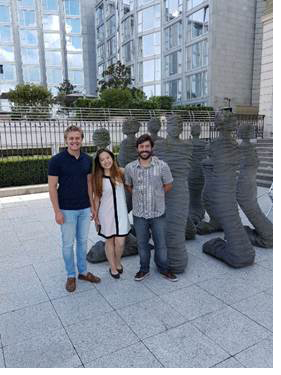 In August 2018, 10 LLB and JD students participated in the MUPR Competition held in Seoul, South Korea. HRLF collaborated with Human Asia, a South Korean human rights NGO, to create this unique opportunity for CityU law students. The aims of the MUPR are to encourage participating students to understand human rights challenges and explore sustainable solutions to such challenges in a given country that they represented. By simulating the UN Human Rights Council’s universal periodic review system, the MUPR also allows students to learn how the UPR works at the UN level. Moreover, Human Asia organised an all-day human rights tour of Seoul for participating students. 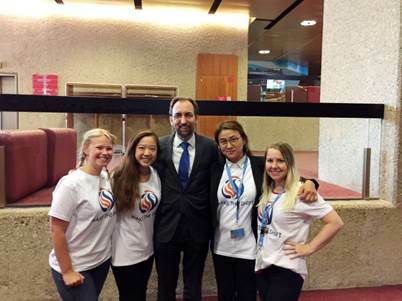 My summer at the OHCHR was an amazing and eye-opening experience. Over the ten weeks at the UN Headquarters for Human Rights in Geneva, I had the opportunity to attend various events, conferences, and training offered by the United Nations. Besides working with my team, I also had the opportunity to participate in a Global Consultation of OHCHR, an open discussion conference that happens every four years to discuss and address current issues and priorities. Participating in different small group discussions and listening to the views of OHCHR and government representatives on controversial issues, including business and human rights, was a rewarding and fascinating experience. This unique internship allowed me to understand the impact of international law on a global scale and has further fuelled my passion for law. Thanks to the support I received from CityU, I was able to spend 3 months in Geneva, Switzerland as an intern at the OHCHR. During my time at the OHCHR, I was given the opportunity to work in a variety of different areas, such as “Illicit Financial Flows” which studies the impact of tax evasion and tax avoidance on the rights of citizens. My time at the UN was a learning rollercoaster which I thoroughly enjoyed. It has given me a new perspective on international human rights, and I believe it will have a lasting impact on my career path going forward. In July 2018, I did internship with pNan, a Korean NGO which aims to protect and assist international refugees seeking asylum in Korea and abroad. I was there to research the UN resettlement programs of taking refugees carried out in the UK. I also looked for the social integration policies in the EU countries from a comparative approach, particularly how to prevent refugees from the poverty trap. Our research group made a presentation about how countries such as UK, USA, Canada and Germany review the applications of asylum seekers. Based on our research, pNan would make recommendations to the Korean government to improve their procedure to review applications of asylum seekers. During the research, we learned both international and Korean domestic laws concerning the refugees. Furthermore, we got to know the implementations of those laws in various countries, and the roles of UNHCR and NGOs in refugees’ protection around the world. In a nutshell, the internship with nPan not only enriched my knowledge of international human right laws, it also exposed me about the global plight of refugees.